This actually happened a while back this summer and I had been meaning to report it here earlier but somehow getting sidetracked along the way. But after an email exchange with another collector who was previously unaware, I decided it was really high time I get around to mentioning it here. Over this summer I was quite pleased when friend and fellow Omega enthusiast Sam Hewitt called to let me know that my X-33 article had been mentioned in the factory-sanctioned “Omega Lifetime” magazine. As a collector, this is one of those little things that happens once in a while that just makes me grin. As I’ve written before, I mostly think of my writings here as catering to a very limited audience of friends and collectors, with the occasion passers-by who wander in by way of Google and such. When evidence emerges that there’s potentially an impact on the wider world, it’s often at least a little bit heartening. At first, I was quite flattered when I learned that the Omega X-33 Article I had authored with Bsodmike garnered a mention in the magazine. While perhaps not quite so scholarly or academic as the journals of some brands (IWC fans in particular are blessed with a really excellent journal! ), I must admit I was initially quite pleased when I heard the news. Scan from "Omega Lifetime" magazine with the mention. Scan courtesy James Dowling. Hyperbole aside, I found it a little demeaning that the author regarded our work as “lore” as the typical usage implies a mythological or popular or pseudo-science connotation, a denigration that seems inappropriate as we went to considerable lengths to cite and explain sources throughout. And quite to the contrary, I went out of my way in the article to explain that the X-33 often did not always have much esteem credibility among collectors of the original mechanical Speedmaster Professional, the late Chuck Maddox among them. In fact, I’m at a loss to explain how the author arrived at this determination at all. The X-33 has its share of admirers, but admirers of the original Speedy Pro are not necessarily among them. Referring to a circa 1998-2006 model as “vintage” is something of a stretch to say the very least. And come to think of it, I don’t recall ever addressing value either. Seems an inappropriate subheading at the very best, doesn’t it? The author seems to have missed it, but both authors of the article have long since sold our X-33’s in favor of other collecting interests. Passion misguided so it would seem, at least as the author would have it. It might not be obvious to the casual reader, but as explained in the (lamentably) verbose introduction the X-33 article it written in a somewhat haphazard fashion. Mostly owing to its ad-hoc collaborative evolution from the inside out from loose collections of notes and email conversations that were assembled in fits and binges of free time over a period of months, the X-33 article is characterized by (lamentably) rambling prose and… well, (lamentably) bad writing. And I was quite (lamentably) annoyed to see what appeared to be artifacts of said loose prose emerging in the “Omega Lifetime” article in the form of what seemed to me to be paraphrased but uncited excerpts, the kind that might have gotten me in considerable trouble as a university student. I was equally dismayed and annoyed that although the author’s approach was mostly rational and disciplined, the author made several unwarranted and unsupported (if not just plain wrong) assertions that tended to exaggerate the significance of the X-33. For instance, despite the author’s claims the Omega Speedmaster X-33 was not an original, ground-up design by any stretch of the imagination whatsoever. It was quite plainly an updated, upgraded, recased and adapted-to-suit-NASA spec Omega Seamaster Multifunction. Even the X-33 unique movement/module was given a factory calibre designation of 1666, only a single digit removed from the cal. 1665 used in the Seamaster Multifunction. The notion that the Speedmaster X-33 was a unique and original creation is thus a fairly preposterous claim. But in the end… ah, to hell with it. 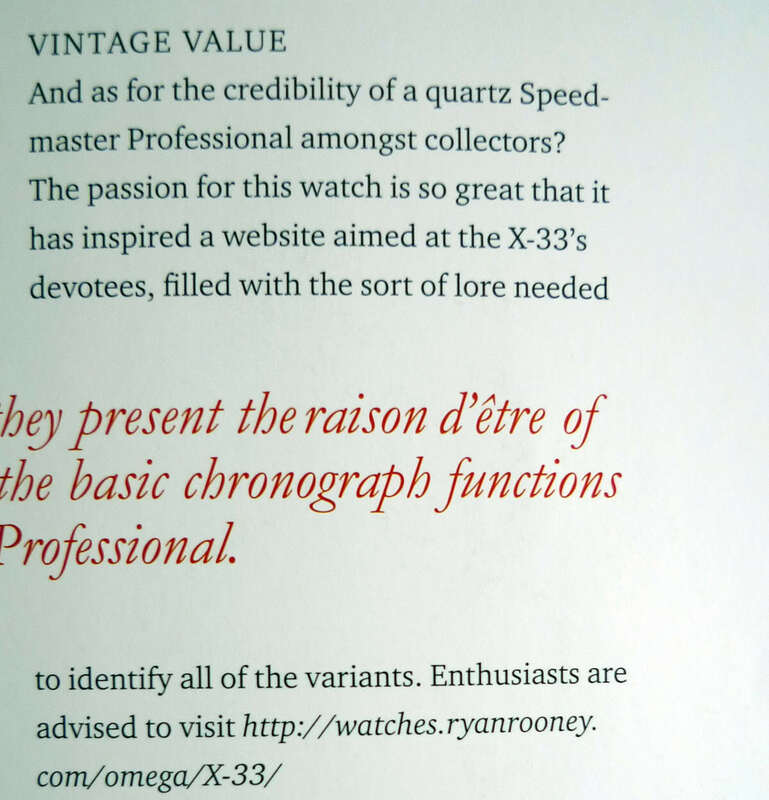 I have to admit, it still felt pretty good to get a mention in the Omega factory periodical, problematic as it might be. I’m even somehow looking forward to subsequent issues, though I hope the editors and contributing authors of the magazine can display greater diligence in research and respect for the contributions of online collector world in the future.